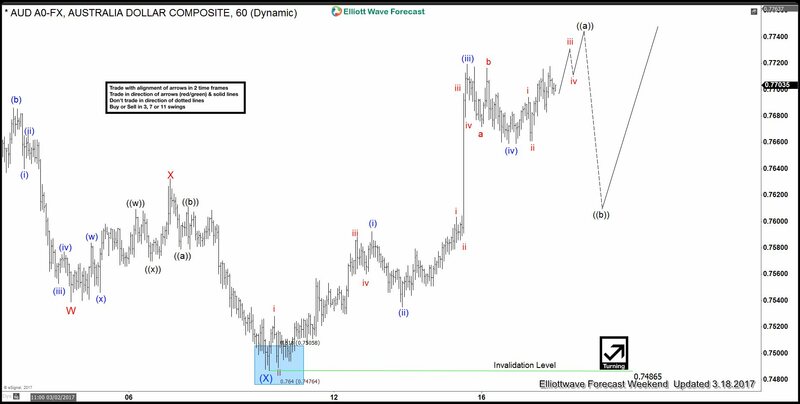 Discussion in 'FOREX Forums' started by Elliottwave-Forecast.com, Mar 7, 2017. 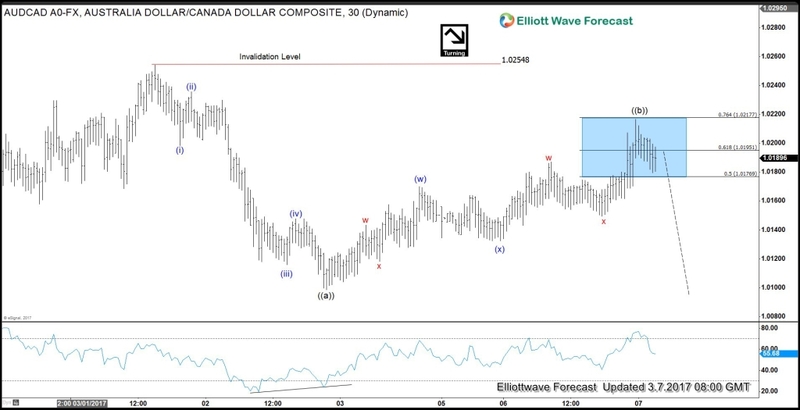 Short term #Elliottwave structure of AUDCAD from 3/1 peak (1.025) looks to be showing an impulse structure with a nice 5 waves subdivision where Minuette wave (i) ended at 1.0198, Minuette wave (ii) ended at 1.0235, Minuette wave (iii) ended at 1.0115, Minuette wave (iv) ended at 1.0147, and Minuette wave (v) ended at 1.0098. We can also see momentum divergence at the end of wave (v) as shown by the RSI making lower high while price makes lower low. This 5 waves down form a higher degree Minute wave ((a)) of a zigzag structure. The 5 waves move from 1.025 high doesn't look to be part of wave C of a FLAT in higher degree structure, which implies that while AUDCAD stays below 1.025, we can see another leg lower in the pair in wave ((c)) to end the zigzag structure. 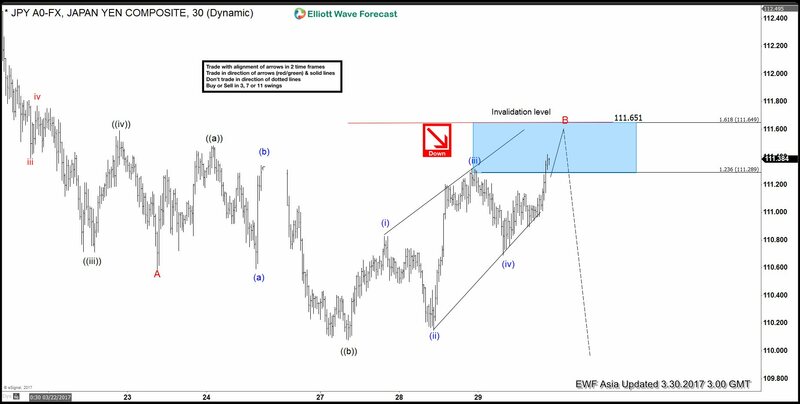 Potential target for wave ((c)) is towards 1.0025 – 1.006 area. EURUSD Elliott Wave Sequence from 2/2 peak doesn’t support the idea of 5 wave impulse or even a series of 1,2’s. Decline from 2/2/2017 high to 2/15/2017 low was a 7 swing sequence and the decline from 2/16/2017 to 2/22/2017 low was also a 7 swing decline. This means neither leg down from 2/2/2017 peak was in 5 waves. Even if we were to force the bias and view the two legs down from 2/2/2017 peak as a 5 wave move, still the decline from 2/2/2017 peak is not an impulse because price has already broken above the down trend line connecting 2/2/2017 high to 2/16/2017 high which negates the idea of a bearish 1,2, ((i))-((ii)). Thus, we can conclude that based on EURUSD Elliott Wave Sequence, decline from February peak is not an impulsive. EURUSD Elliott Wave sequence from February peak suggests cycle from 2/2/2017 high ended at 2/22/2017 (1.0492) and pair has either already finished the bounce at 3/6/2017 (1.0640) high or will hold 2/22/2017 (1.0492) low during this pull back and make another extension higher to do a double correction up from 1.0492 low. JPY (USDJPY) made a new high above last Friday’s peak and now seems to be pulling back. 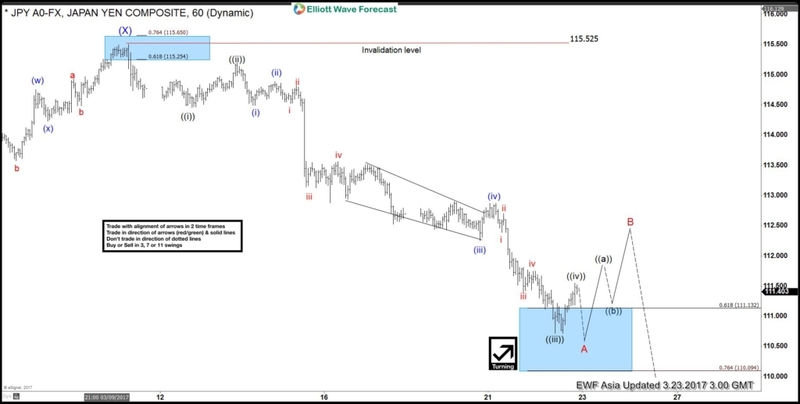 Move up from 113.53 ((x)) low could be viewed as a 5 swing Leading Diagonal Elliott Wave structure. There is RSI divergence (not showing) between red wave iii and blue (a) which further supports the idea of JPY move up from 113.53 low being a diagonal structure. As per Elliott Wave theory, after a 5 wave move up or diagonal structure higher completes, pair should make a corrective pull back before rallying again. Decline from 114.93 -114.48 could be viewed as just the first leg of proposed wave (b) pull back. As current bounce stays below 114.93, pair has scope to make another push lower to complete wave (b) pull back before it turns higher again in wave (c) towards 115.30 -116.11 area. As pair is showing 5 waves up from 113.53 low, we don’t like selling the pair in proposed wave (b) pull back and expect it to find intra-day buyers in the dip as far as price stays above 113.53 low and the pivot there remains intact. Break above 114.93 would suggest wave (b) completed already at 114.48 and pair has started the next leg higher in wave (c) toward the above mentioned area. Last week , GBP USD ended the cycle from 02/02/2017 peak which unfolded as a double three Elliott wave structure with a FLAT in the Y leg. Pair slightly exceeded 123.6 Fibonacci extension (1.2145) of the first 3 swings lower from 2/2 peak before making a push higher today. With the bounce seen today, it has become more clearer that pair has ended the cycle at least from 2/24 (1.2570) high at least and as dips hold above 1.2132 low, pair can extend into the bounce . In the near-term , the pair ended 3 waves bounce and it’s expected to pullback lower against the recent low 1.2132 . The pair should hold above that level for 1 more leg higher at least and could reach as highs as 50 – 61.8 Fibonacci retracement area that comes around 1.2420 – 1.2486 area. If GBP USD makes another low, it should still be in the same cycle from 2/2 (1.2706) and decline could then be labelled as an ABC from 02/02 peak and the new low will be part of wave (( v )) of C New low, if seen, should be short-lived and we can see the pair bouncing again from 1.2100 – 1.2009 area. 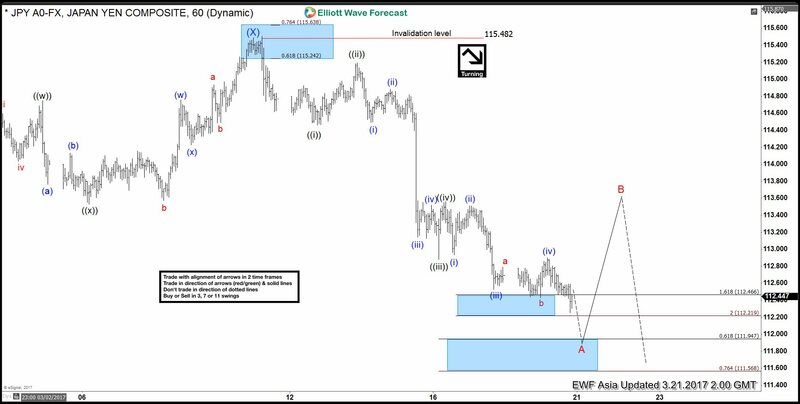 Short term Elliott Wave view in EURJPY suggests that the pair has ended the cycle from 2/24 low (118.18) and the instrument is pulling back to correct that cycle before turning higher again. Primary wave ((5)) is currently in progress higher and the rally from Primary wave ((4)) low at 118.18 is unfolding as an ending diagonal Elliott wave structure where Intermediate wave (1) ended at 122.88. 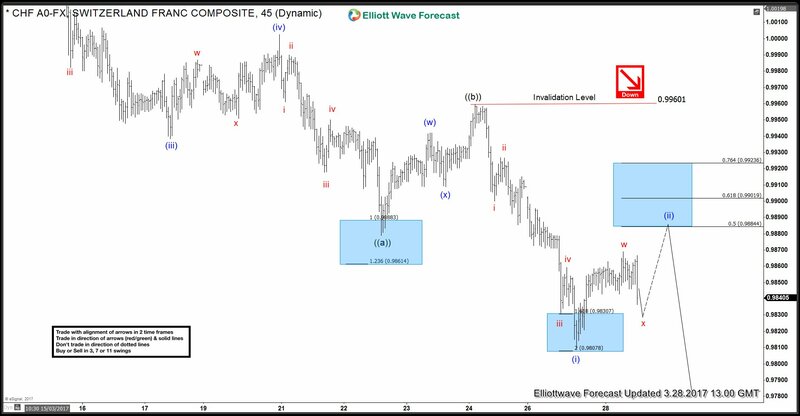 The subdivision of Intermediate wave (2) pullback is proposed to be in a double three Elliottwave structure where Minor wave W ended at 121.59 and Minor wave X bounce is in progress. The subwaves of Minor W looks to be in a zigzag Elliott wave structure, and if the subwaves of Minor Y later also takes the form of a zigzag, then this is a special structure of a double three where the subwave of both wave W and Y unfolds as a zigzag and we can call this structure a double zigzag. Near term, while Minor wave X bounce fails below 122.88 high, pair should turn lower in Minor wave Y of (2) towards 119.97 – 120.53 area before pair resumes the rally higher, provided that pivot at 118.18 low stays intact. We don’t like selling the proposed pullback and expect buyers to appear at above area for at least 3 waves bounce. 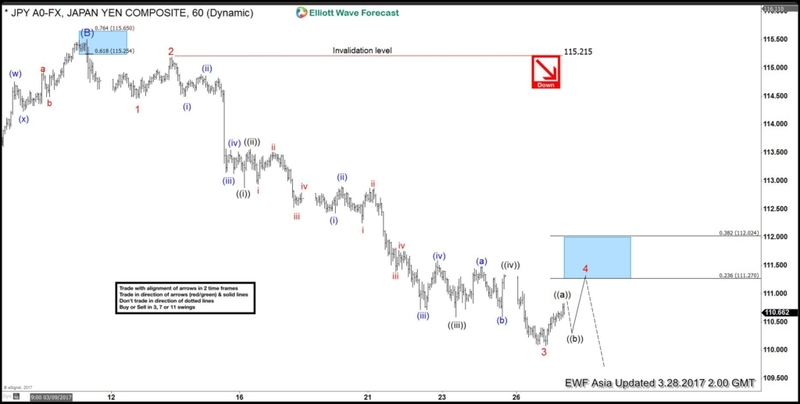 Short term Elliott Wave view in EURJPY suggests that the decline to 118.18 on 2/24 ended Primary wave ((4)). Primary wave ((5)) is currently in progress higher and the rally from Primary wave ((4)) low at 118.18 is unfolding as an ending diagonal Elliott wave structure where Intermediate wave (1) ended at 122.88. The subwaves of Intermediate wave (1) takes the form of a zigzag Elliott wave structure where Minor wave A ended at 121.19, Minor wave B ended at 119.97, and Minor wave C of (1) ended at 122.88. Intermediate wave (2) pullback is unfolding as as a double three structure where Minor wave W ended at 121.59, Minor wave X ended at 122.06 and Minor wave Y of of (2) is proposed complete at 121.16. While pullbacks stay above there, and more importantly above 118.18, expect pair to resume the rally higher, provided that pivot at 118.18 stays intact. If pair breaks below 121.16 here, then it’s still within Minor wave Y of (2) and can open extension lower towards 120.45 – 120.75 area before pair turns higher again. We don’t like selling the proposed pullback and favor the longside as long as pivot at 118.18 low stays intact. Revised view suggests that Intermediate wave (2) pullback is still in progress in 7 swing or a double three structure where Minor wave W ended at 121.087. While Minor wave X bounce fails below 122.88, pair has scope to turn lower one more leg in Minor wave Y of (2) towards 119.27 – 120.52 area before the rally resumes. We don’t like selling the proposed pullback and expect buyers appear at 119.27 – 120.52 area for an extension higher or at least 3 waves bounce as far as pivot at 118.18 low stays intact. If pair breaks above 122.88 from here, that will suggest that Intermediate wave (2) has ended at 121.087 and pair has resumed the rally higher. AUDUSD ended the correction in Intermediate wave (X) after reaching 0.7486 and then started rallying from there. With today’s new high the pair is showing 5 waves impulsive move from 03/09/2017 low and has already reached the minimum target area for Minutte wave (v) to end. The minimum target for Minutte wave (v) can be calculated as the inverse 1.236-1.618 Fibonacci extension of Minutte wave (iv) which comes at 0.7734 – .07753. Short term, an extension higher can’t be ruled out as there are still 2 other methods for calculating the 5th wave and one method of calculating (v) = (i) gives us a higher target around the equal legs area at 0.7765 – 0.7790. However, we need to be aware that cycle from 3/9 low (0.7486) is mature and pair can complete Minute wave ((a)) any moment and then start Minute wave ((b)) pullback in 3 , 7 or 11 swing to correct cycle from 3/9 low. After ending at least 3 waves pullback in Minute wave ((b)), we expect AUDUSD to find buyers for the next leg higher as it has a bullish sequence from December 2016 low due to breaking above 02/23/2017 high (0.7740). 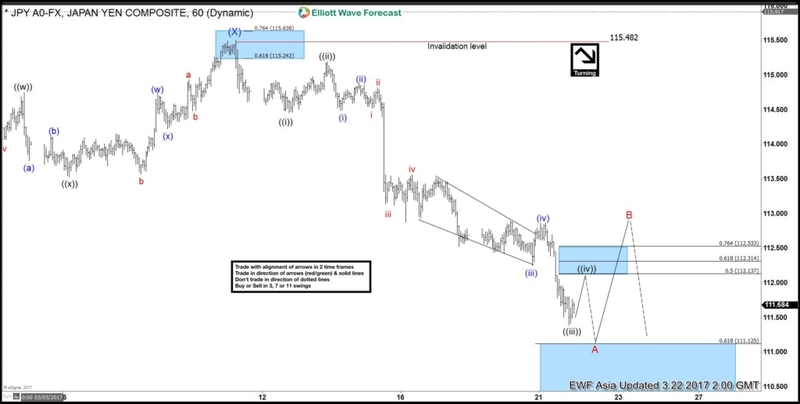 Short term Elliott Wave view in USDJPY suggests that rally to 115.48 on 3/10 ended Intermediate wave (X). Decline from there is unfolding as a zigzag Elliott wave structure in which the first leg wave A is subdivided in 5 impulsive waves. Down from 3/10 high, Minute wave ((i)) ended at 114.46, Minute wave ((ii)) ended at 115.195, Minute wave ((iii)) ended at 112.88 and Minute wave ((iv)) ended at 113.56. Cycle from 3/10 high is mature and Primary wave A has enough extension to be called complete, but more downside towards 111.56 – 111.95 area can’t be ruled out to complete Primary wave A. Afterwards, pair should bounce in Primary wave B in 3, 7, or 11 swing to correct cycle from 3/10 high before the decline resumes. A break above proposed Minutte wave (iv) at 112.9 may be an early indication that Primary wave A has ended. 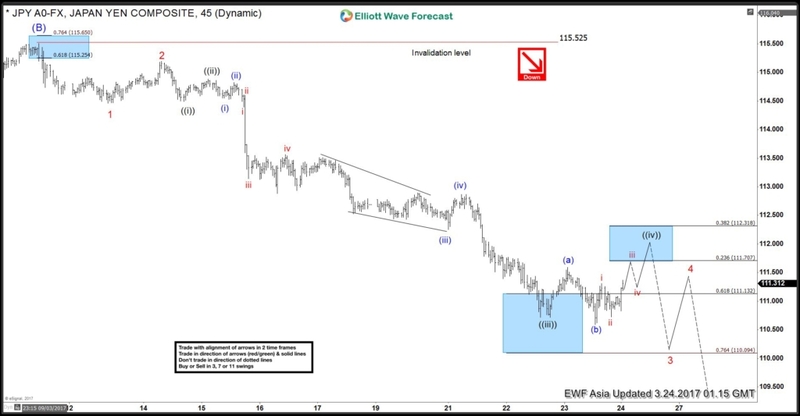 Short term Elliott Wave view in USDJPY suggests that rally to 115.48 on 3/10 ended Intermediate wave (X). Decline from there is unfolding as a zigzag Elliott wave structure in which the first leg Minor wave A is subdivided in 5 impulsive waves. Down from 3/10 high, Minute wave ((i)) ended at 114.46, Minute wave ((ii)) ended at 115.195, Minute wave ((iii)) ended at 112.88 and Minute wave ((iv)) ended at 113.56. Cycle from 3/10 high is mature and Minor wave A has enough extension to be called complete, but more downside towards 110.088 – 111.12 area can’t be ruled out to complete Minor wave A. Afterwards, pair should bounce in Minor wave B in 3, 7, or 11 swing to correct cycle from 3/10 high before the decline resumes. We do not like buying the proposed bounce in Minor wave B and expect sellers to appear when Minor wave B bounce is done in 3, 7, or 11 swing later for another extension lower. 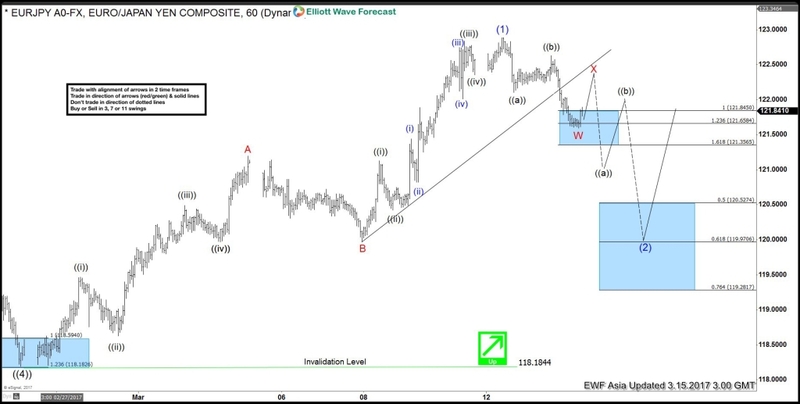 Short term Elliott Wave view in USDJPY suggests that rally to 115.48 on 3/10 ended Intermediate wave (X). Decline from there is unfolding as a zigzag Elliott wave structure in which the first leg Minor wave A is subdivided in 5 impulsive waves. Down from 3/10 high, Minute wave ((i)) ended at 114.46, Minute wave ((ii)) ended at 115.195, Minute wave ((iii)) ended at 110.71 and Minute wave ((iv)) is proposed complete at 111.59. Cycle from 3/10 high is mature and Minor wave A has enough extension to be called complete, but a marginal low towards 100 – 110.5 area can’t be ruled out to complete Minor wave A. Afterwards, pair should bounce in Minor wave B in 3, 7, or 11 swing to correct cycle from 3/10 high before the decline resumes. We do not like buying the proposed bounce in Minor wave B and expect sellers to appear when Minor wave B bounce is over in 3, 7, or 11 swing later for another extension lower. We are taking the more aggressive view in USDJPY and calling the rally to 115.48 on 3/10 as Intermediate wave (B). 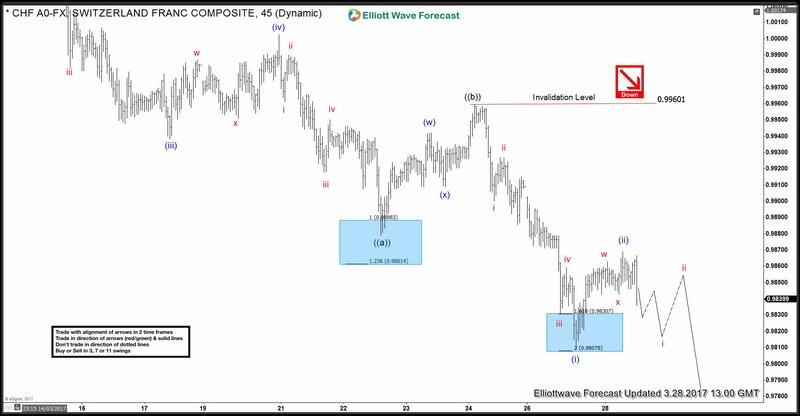 Decline from there is unfolding as a 5 waves impulse Elliott wave structure with an extension in wave 3. Down from 115.48, Minor wave 1 ended at 114.46 and Minor wave 2 ended at 115.2. Minor wave 3 is extended and further subdivided into 5 impulse waves where Minute wave ((i)) ended at 114.49, Minute wave ((ii)) ended at 114.82 and Minute wave ((iii)) is proposed complete at 110.714. Minute wave ((iv)) currently is in progress as a Flat Elliott Wave structure towards 111.7 – 112.3 area before pair turns lower in Minute wave ((v)) of 3. Afterwards, pair should bounce in Minor wave 4 and later on still see further downside to complete Minor wave 5 towards as low as 106.85 – 108.5 area. Bounces therefore are expected to be limited and shallow. If current bounce is getting too big, then as an alternate, the move lower in USDJPY from 115.52 high is unfolding as a zig zag Elliottwave structure where Minor wave A ended at 110.58 low with subdivision of 5 impulsive waves . Current bounce will then be Minor wave B to correct decline from 3/10 high (115.52) before pair resumes lower again in Minor C. This alternate view is the less aggressive view but still calling for more downside in the pair as far as pair stays below 3/10 high. In both views (aggressive and less aggressive), we don’t like buying the pair. AUDUSD is showing 5 swings sequence from 12/23/2017 low after it managed to break above 02/23 peak so the sequence is bullish against Intermediate wave (X) low (0.7487). The pair did 5 waves impulsive move from 03/09 low in Minute wave ((a)) which ended at 03/23 peak (0.7749) and currently doing Minute wave ((b)) pullback that’s unfolding as a double three structure. 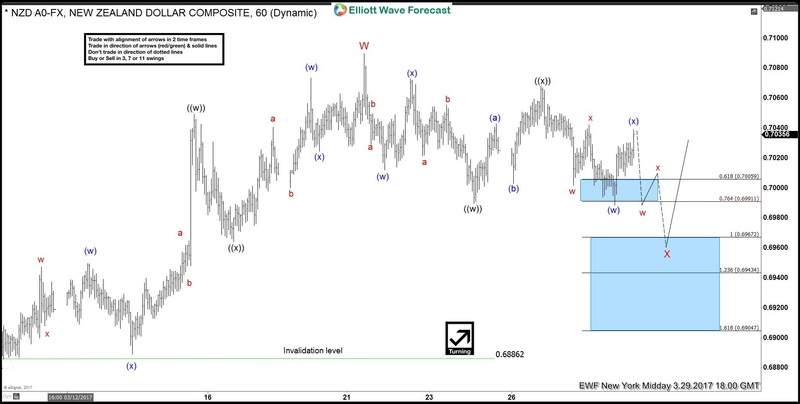 We expect Minute wave ((b)) to complete in the blue box equal legs area (0.7571 – 0.7544) where AUDUSD can resume the rally for new highs or bounce in 3 waves at least. If the pair manage to get above (0.7683) high before reaching the inflection area then there is a chance that Minute wave ((b)) ended and the next leg to the upside started already. We don’t like selling the pair and expect buyers to appear in above mentioned area for new highs above wave ((a)) or a 3 wave bounce at least. We are taking the more aggressive view in USDJPY and calling the rally to 115.48 on 3/10 as Intermediate wave (B). Decline from there is unfolding as a 5 waves impulse Elliott wave structure with an extension in wave 3. Down from 115.5, Minor wave 1 ended at 114.46 and Minor wave 2 ended at 115.2. Minor wave 3 is extended and further subdivided into 5 impulse waves where Minute wave ((i)) ended at 112.88, Minute wave ((ii)) ended at 113.56 and Minute wave ((iii)) ended at 110.59, Minute wave ((iv)) ended at 111.34, and Minute wave ((v)) of 3 is proposed complete at 110.077. Minor wave 4 bounce is currently in progress towards 111.27 – 112.02 area, which is 23.6 – 38.2 retracement of Minor wave 3, before further downside is seen to complete Minor wave 5 towards as low as 106.85 – 108.5 area. 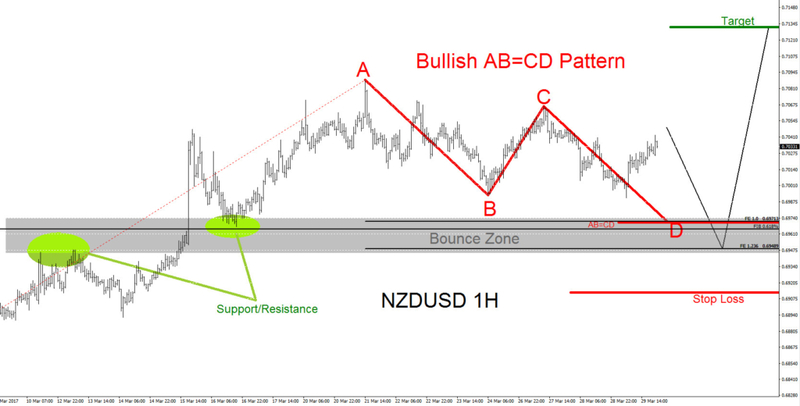 Bounce is expected to be limited and shallow. If the current bounce gets too big, then as an alternate, the move lower in USDJPY from 115.5 high is unfolding as a zig zag Elliottwave structure where Minor wave A ended at 110.077 low with subdivision of 5 impulsive waves . In this alternative view, current bounce will then be bigger as it’s a Minor wave B bounce to correct decline from 3/10 high (115.52), but still as far as pivot at 115.2 stays intact, pair should resume lower again in Minor C. This alternate view is the less aggressive view but still calling for more downside in the pair as far as pair stays below 3/10 high. In both views (aggressive and less aggressive), we don’t like buying the pair. USDCHF decline from 3/7 (1.0170) high to 3/22 (0.9879) low could be viewed as a 5 swing move that we have labelled as Elliott wave ((a)). 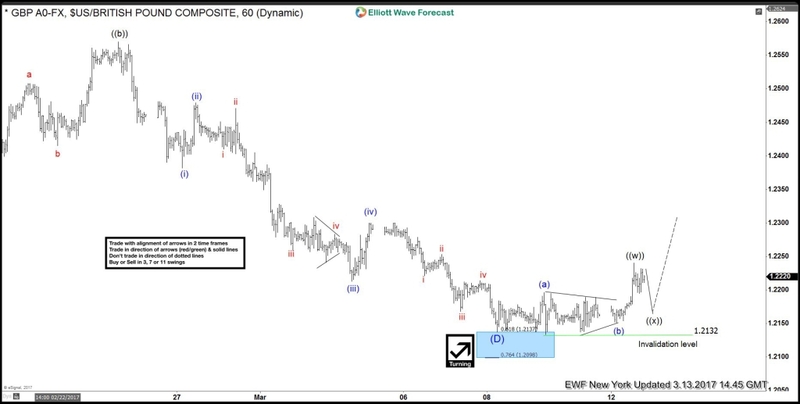 Bounce to 0.9960 was a three move and completed Elliott wave ((b)). Pair has since dropped to a new low below 0.9879 confirming the view that wave ((b)) ended at 0.9960. Decline from 0.9960 – 0.9809 was again in 5 swings and completed wave (i) of ((c)). Pair has already done 3 wave bounce to 0.9868 which could be all of wave (ii) and pair can now resume the decline in wave (iii). Pair doing small 5 waves from 0.9868 high will add conviction to this view but we would need to see a break below 0.9809 low to confirm wave (ii) ended at 0.9868 and wave (iii) of ((c)) lower is in progress. Until then, another push higher towards 0.9884 – 0.9901 area can’t be ruled out to complete wave (ii) as a double three w-x-y structure. In either case, as pair is showing an incomplete bearish sequence down from 3/7 (1.0170) high, we expect the bounces to fail below 0.9960 high for extension lower and in case of another push, expect the pair to find sellers in 0.9884 – 0.9901 area. This view remains valid as far as price stays below 0.9960 high. Ideal target for wave ((c)) lower to complete is in the region of 0.9684 – 0.9569 and we can see the pair turning higher from there in 3 waves at least. Pair showing small 5 waves from blue wave (ii) peak will add conviction to this view and a break below 0.9809 will confirm this idea. Pair has already done 3 waves up from 0.9809 low and has minimum number of swings in place to call wave (ii) completed. However, while above 0.9809 low, another 3 swings higher and a test of 0.9884 – 0.9901 area can’t be ruled out to complete wave (ii) as a 7 swing structure before decline resumes. In either case, expect rallies to fail below 0.9960 high for extension lower in USDCHF. 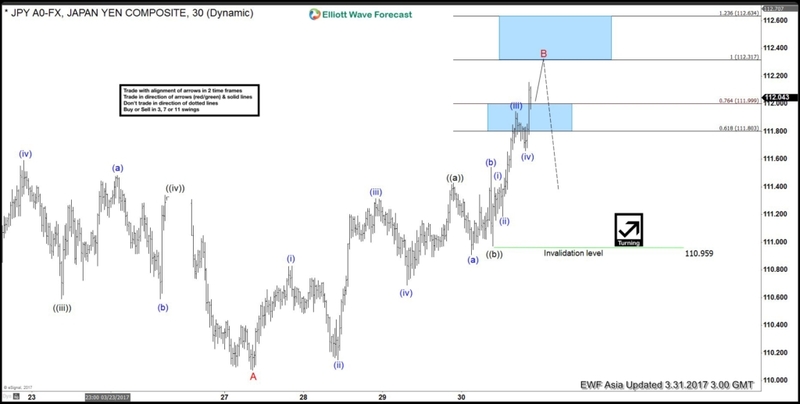 Short term Elliott Wave view in USDJPY suggests that cycle from 3/10 peak (115.53) has ended with Minor wave A at 110.07. 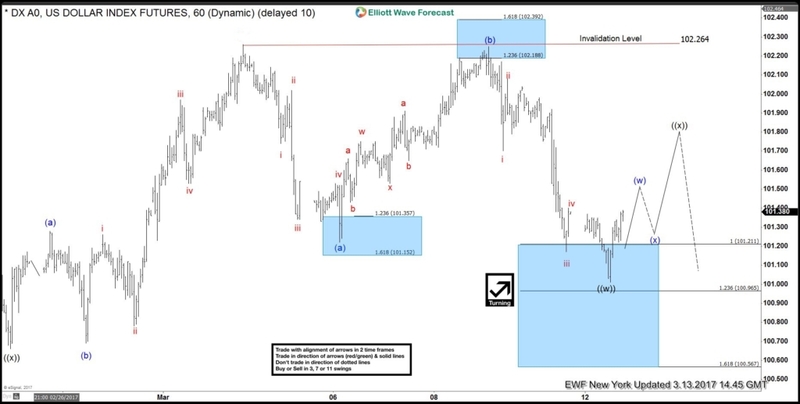 Decline from 115.53 is unfolding as a 5 waves impulse Elliott wave structure with an extension where Minute wave ((i)) ended at 114.46, Minute wave ((ii)) ended at 115.19, Minute wave ((iii)) ended at 110.59, Minute wave ((iv)) ended at 111.34, and Minute wave ((v)) of A ended at 110.07. USDJPY ended cycle from 3/10 peak and correcting that cycle in wave B bounce in 3, 7, or 11 swing. 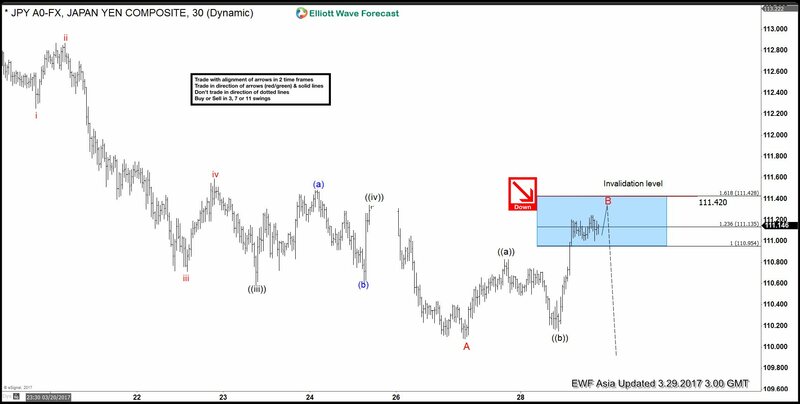 Wave B bounce is unfolding as an Expanded Flat Elliott wave structure where Minute wave ((a)) ended at 110.82 and Minute wave ((b)) ended at 110.15. Minute wave ((c)) of B ideally ends at 111.13 – 111.42 area or 1.236 – 1.618 extension of Minute ((a)) and ((b)) and from the area, pair should then either resume to a new low or at least pullback in 3 waves. However, due to the nature of an expanded Flat structure, wave C of a Flat can extend even beyond 1.618 extension. In other words, cycle from 3/27 low ideally ends at 111.13 – 111.42, but can also extend a bit higher and still considered to be part of the same Flat structure starting from 3/27 low. The more important invalidation level therefore is the pivot at 3/10 high (115.53) and wave B bounce should unfold in 3, 7, or 11 swing and the bounce is expected to stay below 115.53 for the next extension to the downside. We don’t like buying the pair. 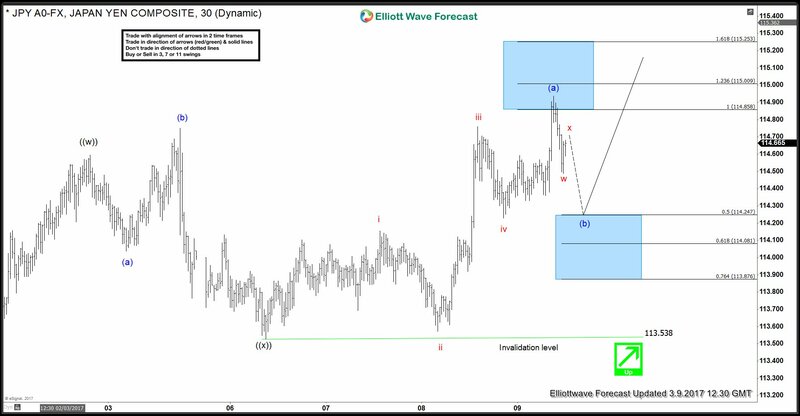 Short term Elliott Wave view in USDJPY suggests that cycle from 3/10 peak (115.53) has ended with Minor wave A at 110.589. Decline from 115.53 is unfolding as a 5 waves impulse Elliott wave structure with an extension where Minute wave ((i)) ended at 114.46, Minute wave ((ii)) ended at 115.19, Minute wave ((iii)) ended at 110.7, Minute wave ((iv)) ended at 111.59, and Minute wave ((v)) of A ended at 110.59. USDJPY ended cycle from 3/10 peak and correcting that cycle in wave B bounce in 3, 7, or 11 swing. 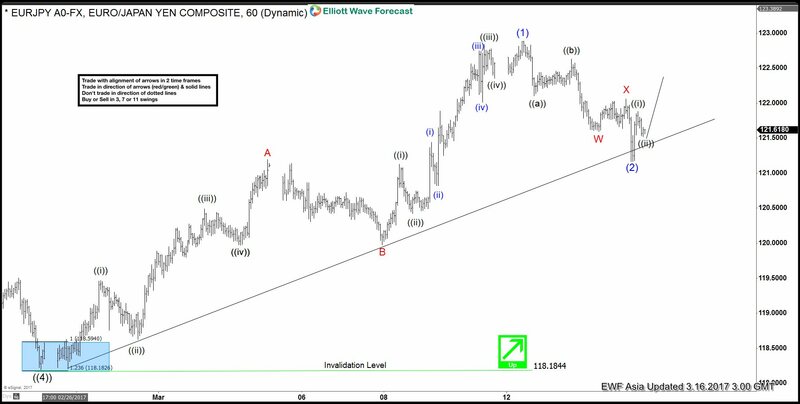 Wave B bounce is unfolding as an Expanded Flat Elliott wave structure where Minute wave ((a)) ended at 111.48 and Minute wave ((b)) ended at 110.077. Minute wave ((c)) of B ideally ends at 111.29 – 111.65 area or 1.236 – 1.618 extension of Minute ((a)) and ((b)) and from the area, pair should then either resume to a new low or at least pullback in 3 waves. However, due to the nature of an expanded Flat structure, wave C of a Flat can extend even beyond 1.618 extension. In other words, cycle from 3/27 low ideally ends at 111.29 – 111.65, but can also extend a bit higher and still considered to be part of the same Flat structure starting from 3/27 low. The more important invalidation level therefore is the pivot at 3/10 high (115.53) and wave B bounce should unfold in 3, 7, or 11 swing and the bounce is expected to stay below 115.53 for the next extension to the downside. We don’t like buying the pair. Although the Fed is in the rate hike cycle, USD rally started to lose momentum early this year when market started to realize that monetary policy divergence started to narrow. ECB has started to talk about rate hikes, while China started to tighten monetary policy by raising money market rates early last month. The Fed also sounded less hawkish in their last rate hike as they forecasted only three rate hikes this year and no Fed members agreed to hike rate four times. US Dollar long bets continued to be paired down after the Republican withdrew the bill on the American Health Care Act (AHCA) last Friday when it became clear that they did not have the minimum 215 votes to make it pass. The AHCA was advocated by Trump and supposed to be the replacement for Obama’s Affordable Care Act (Obamacare). Trump’s opposition from his own party has cast doubt to his ability to deliver on other priorities and also his plan to reduce $350 billion in the coming 10 years. In the past year, Trump’s campaign promise including tax reforms, infrastructure spending, and border-adjusted tax system has generated inflation and growth bets, dubbed as “Trump trade”, and these are supportive factors for the U.S Dollar. AHCA is the first litmus test on Trump’s ability to fulfill his promise and the failure of to pass this proposal could presage the next item on the agenda. With the original supportive factors for US Dollar not realized in the short term and the Fed not hawkish enough, US Dollar may stay soft in the short term. These are the cited reasons for the recent U.S. Dollar weakness, but does technical trading, specifically Elliott Wave, help to anticipate it? 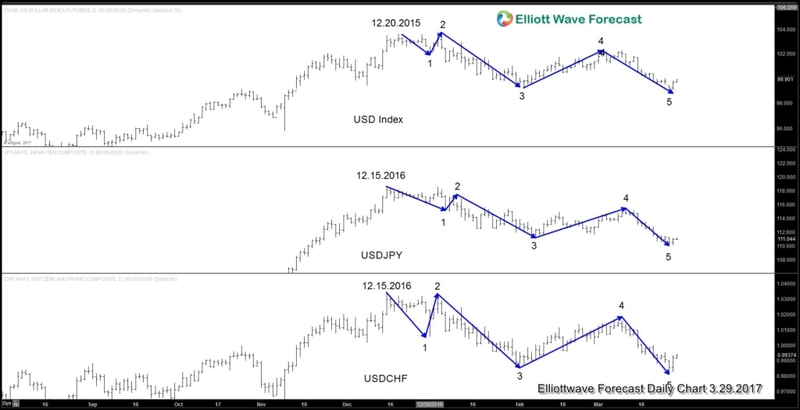 A technical look at US Dollar Index (DXY) and two major USD Pairs (USDJPY and USDCHF) above suggest they show a 5 swing sequence from 12.15.2015 peak, favoring more downside. 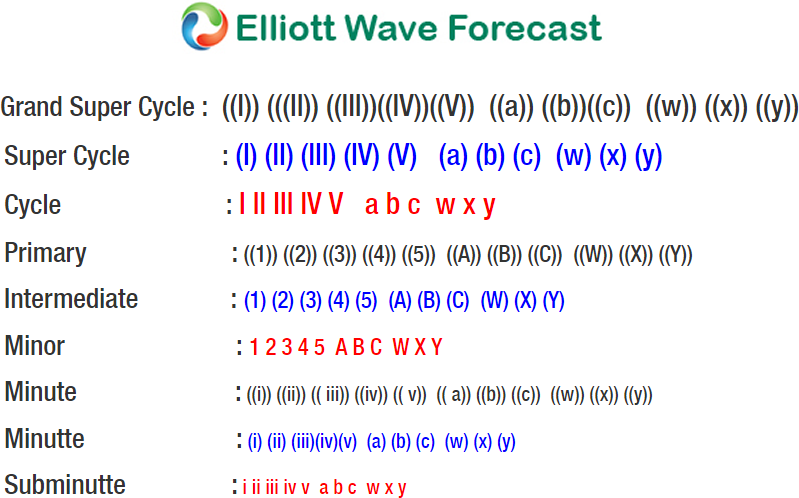 Please note that this is not the same with 5 waves impulse or diagonal, but this is a swing count (sequence) that we use at Elliottwave Forecast. Any bounce in USD pair now ideally stays below March 9 peak for another leg lower. Thus technical outlook suggests that US Dollar may stay soft in the near term. This suggests that a good reading of technical charts can anticipate a move without depending on the outcome of important news events. In addition, technical trading also provides a risk management mechanism that could not be done otherwise. 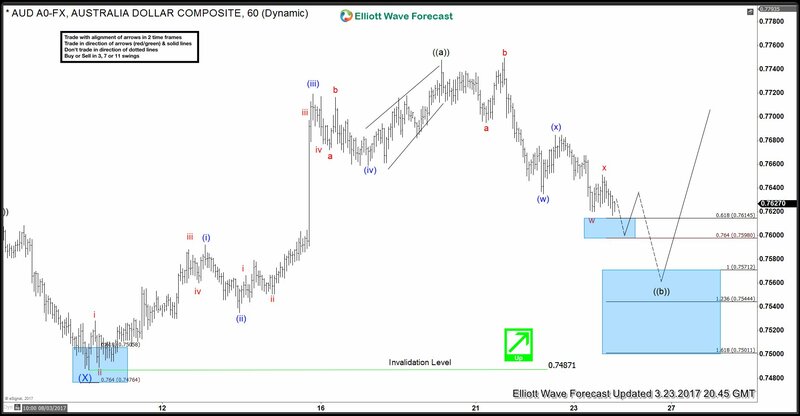 1 Hour Elliott Wave Analysis: NZDUSD is currently in a Elliott Wave double ((w))-((x))-((y)) correction lower on the 1 hour time frame and we expect red wave X to terminate in the 0.6967 – 0.6943 area where the pair should bounce higher. We do not recommend selling the pair to the proposed red wave X terminating area but rather recommend buying in that area for the next possible move higher. The bullish scenario is invalid if price moves below the 0.6886 level. 1 Hour Bullish Pattern: A possible Bullish Pattern (Red) is clear and visible on the 1 hour chart. The red bullish pattern Point D terminates near the 0.618% Fib. retracement and the 1.0 (Equal legs) Fib. extension levels. Also looking back at previous price action we can also see there is a support/resistance zone where price has bounced off. Putting all this together with the above Elliott Wave (chart above) we believe the Bounce Zone (Grey box) will provide good support and NZDUSD should bounce higher off this zone if price reaches this area. 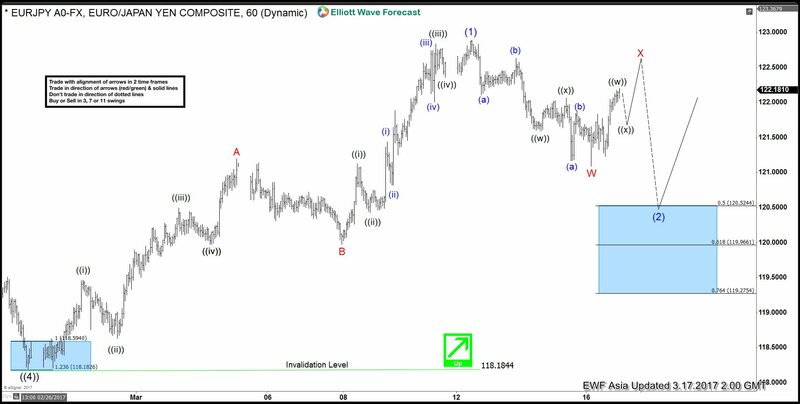 Short term Elliott Wave view in USDJPY suggests that cycle from 3/10 peak (115.53) has ended with Minor wave A at 110.077. Decline from 115.53 is unfolding as a 5 waves impulse Elliott wave structure with an extension where Minute wave ((i)) ended at 114.46, Minute wave ((ii)) ended at 115.19, Minute wave ((iii)) ended at 110.59, Minute wave ((iv)) ended at 111.34, and Minute wave ((v)) of A ended at 110.077. USDJPY ended cycle from 3/10 peak and correcting that cycle in Minor wave B bounce in 3, 7, or 11 swing. 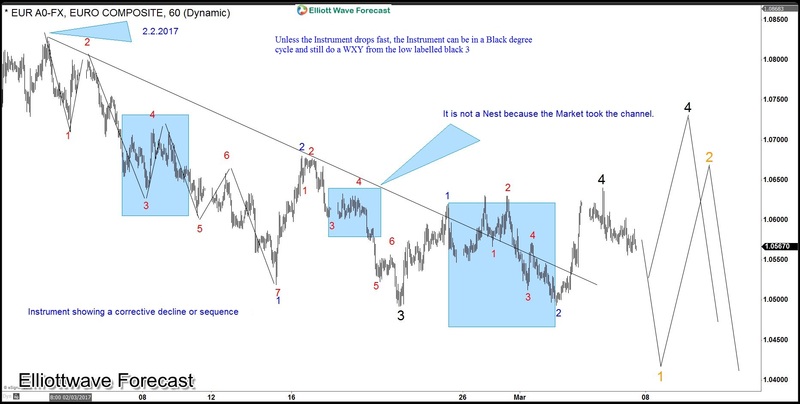 Revised view suggests that Minor wave B bounce is unfolding as a zigzag Elliott wave structure where Minute wave ((a)) ended at 111.426 as 5 waves diagonal and Minute wave ((b)) ended at 110.96. Minute wave ((c)) of B is in progress as 5 waves and expected to complete at 112.31 – 112.63 area before pair resumes lower or at least pullback in 3 waves. As far as pivot at 3/10 high (115.53) stays intact, expect pair to extend lower or at least pullback in 3 waves once Minor wave B is complete.